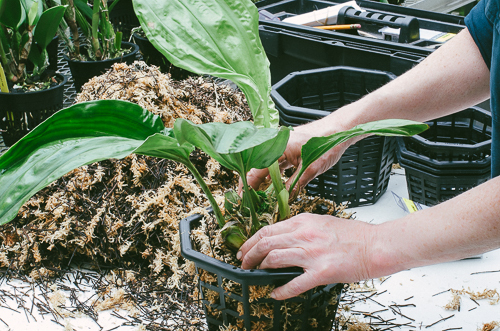 September and October are Stanhopea repotting season for us. 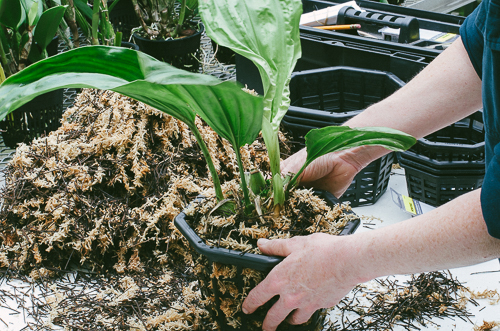 Every grower has their own repotting technique, but I thought you might want to take a look behind the scenes at ours. 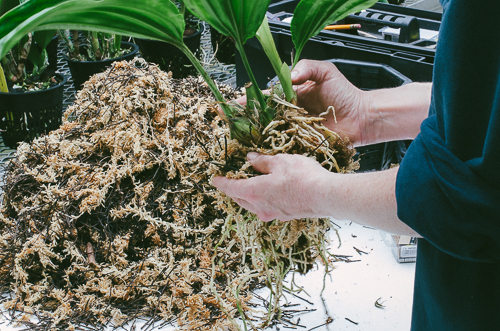 Orchids that are flourishing don't generally appreciate the root disturbance that repotting can inflict. Stanhopeas are no exception. 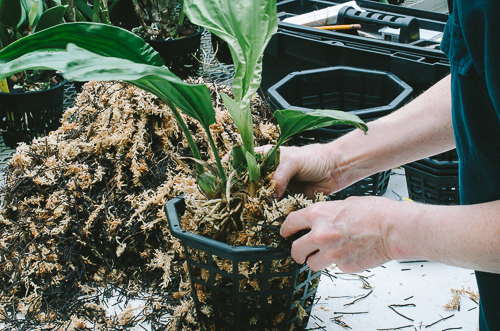 We repot when: 1) The plant has overgrown the pot; 2) The medium needs to be replaced, either because it has deteriorated -after about two years- or because it is inappropriate for our growing conditions; or 3) The plant is in trouble. 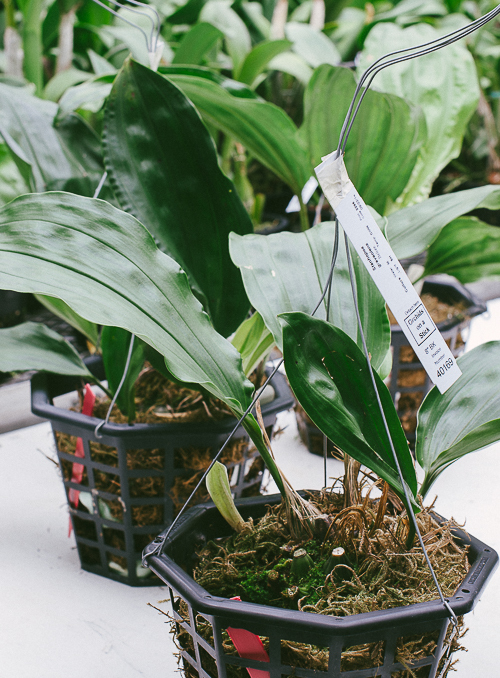 Signs of trouble include desiccated leaves and shriveled or rotting pseudobulbs. The stanhopeas above, which we received last week from Andy's Orchids, fall into the second category. Andy grows his stanhopeas in a medium that works well for him, but turns to mush in our greenhouses during our hot & humid summers. 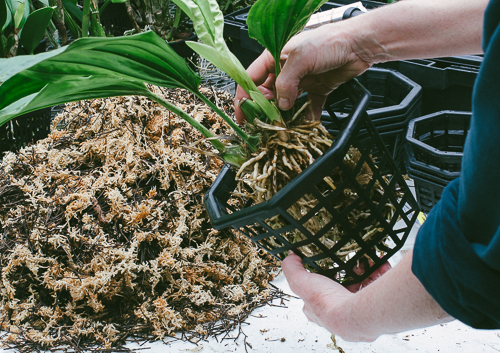 We repot our orchids when the new roots and shoots appear. For most stanhopeas, that's in late summer and early fall. 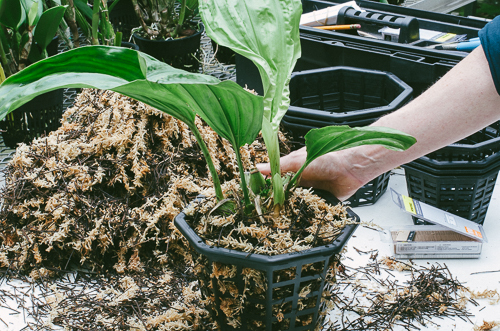 In the photo above, you can see the new shoot on the Stanhopea graveolens in the foreground. Now is the time! Because our plants are far from the main potting bench in the headhouse, I set up a temporary potting bench in our back-up greenhouse. It's just a pair of plastic sawhorses supporting a 5' rectangle of plywood. 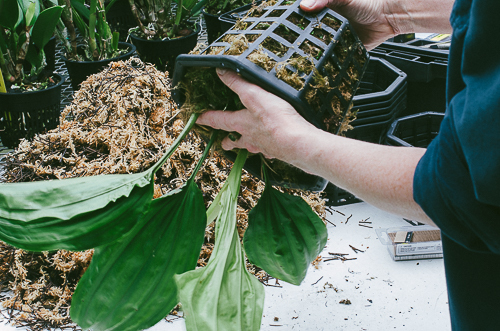 Potting materials include net baskets, razor blades and one of our favorite orchid media, a mixture of long-fibered premium moss and coarse tree fern fiber. The plants were watered the previous day in order to soften the potting medium. 1. 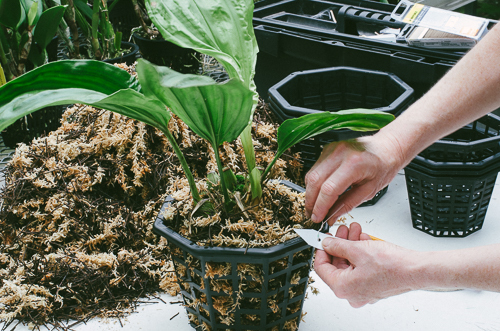 To remove the plant, invert the pot and tap the rim against the edge of the potting bench. 2. 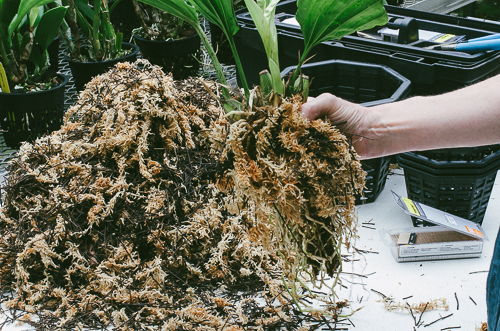 Gently remove the old medium around the exterior of the root mass, small bits at a time so as to not break the new roots. 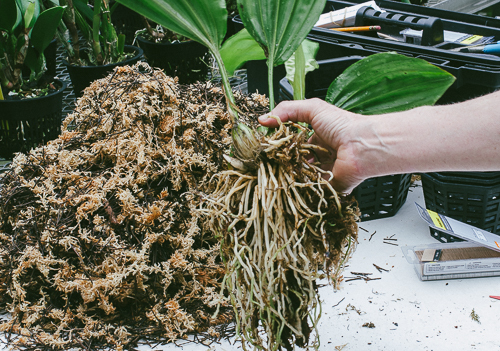 To remove the old medium from the center of the root mass, hold the plant by the pseudobulbs (not by the roots! ), and wash the roots gently under running water. Remove about three quarters of the medium. It's not necessary to remove every bit unless you see rotting tissue. 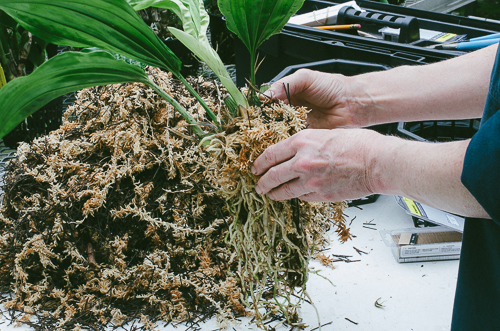 Rotting roots and pseudobulbs are easy to see after washing and can be removed with a razor blade. 3. 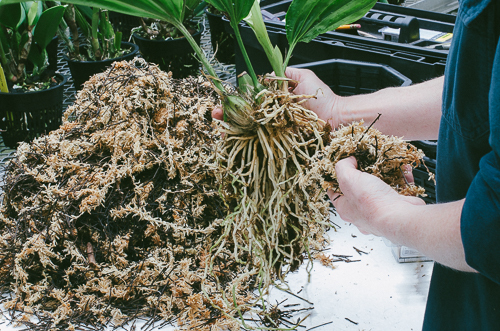 Choose a pot size based on the size of the root mass. For a plant this size, we want a pot about an inch wider than the root mass on all sides. 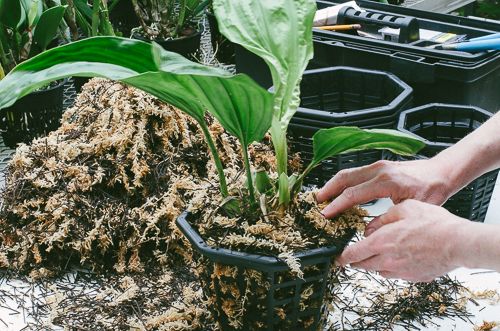 And, for a Stanhopea, choose a basket with openings that allow the downward-growing spikes to emerge from the root mass. 4. If you look closely, you can see two new shoots: on the left, a one-inch white shoot at the base of a pseudobulb; and on the right, a somewhat older leafy shoot. 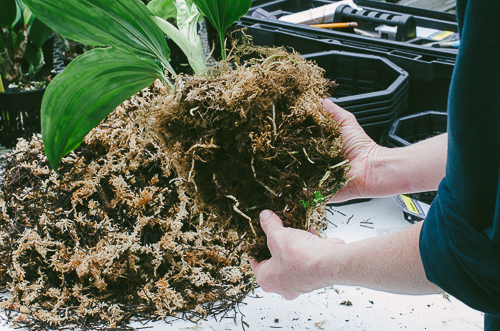 The basic potting technique involves wrapping the root mass in our moss/tree fern medium (aka moss mix) just below those new shoots. 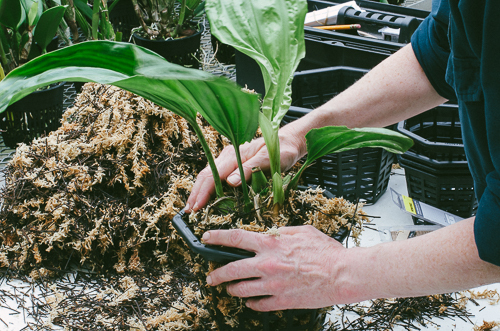 As I demonstrate above, hold the plant by the pseudobulbs with your right hand, then take a small pad of moss mix in your left hand. 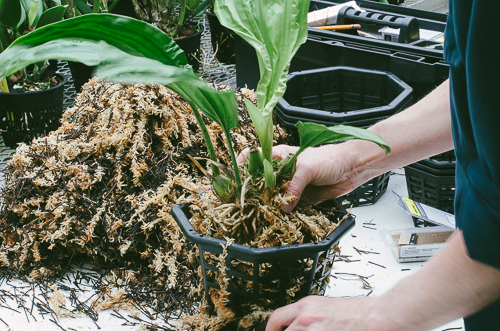 Next, apply the moss pad at the base of the small shoot where the new roots will emerge. Don't cover the new shoot. Then take another small pad of moss mix and apply it to the base of the larger new shoot. 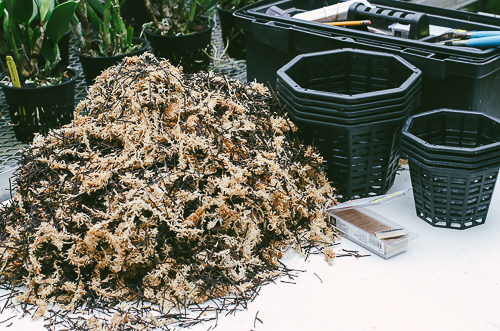 The upper half of the root moss is now wrapped in moss mix. The lower roots hang freely below the moss. 5. With your right hand, center the plant in the pot, suspending it so the roots hang freely and the plant is not resting on its roots. Between the moss and the side of the pot is a cavity about one half inch wide. 6. 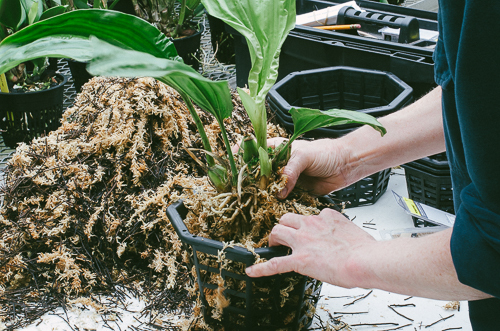 Take small bits of mix and gently fill in the cavity around the roots in the lower half of the pot. And then around the surface. Small air pockets are okay. 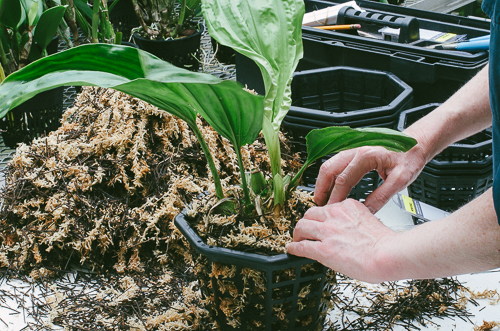 Switch hands and add mix to the right side of the pot, still supporting the plant with your left hand. Each time you add mix, firm it in gently. Add a little more mix all around. Apply gentle pressure all around with your fingertips. 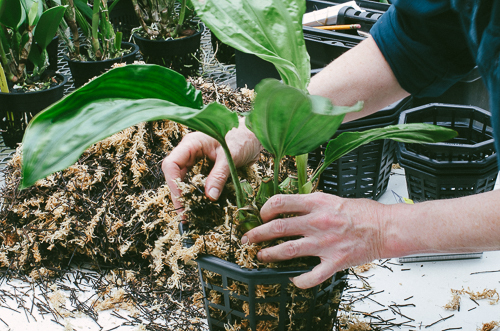 The medium should be firm enough to hold the plant in place so that it doesn't wobble when you move the pot, but should not feel tight or compressed. 7. Label the plant. We use plastic coated telephone wire to attach the label. 8. Done! 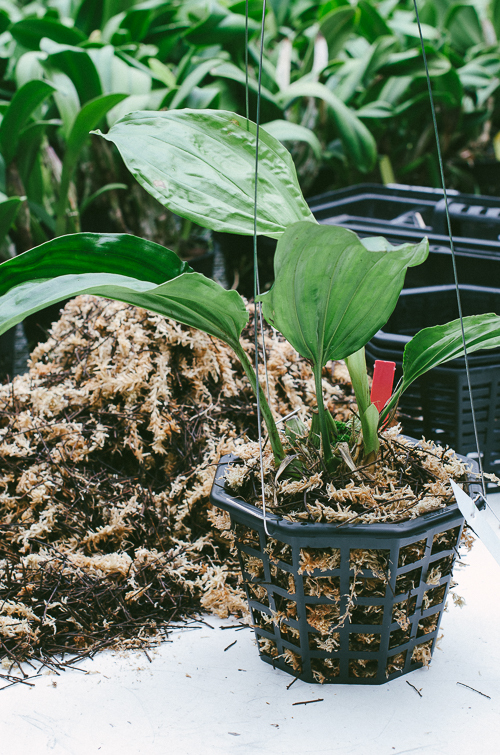 Hanger attached, this Stanhopea is ready to take its place among our collection plants. The red label indicates that it is awaiting accessioning. 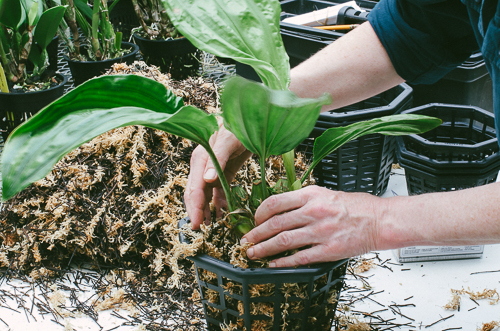 We use this same potting medium and technique for many of our tropical epiphytic orchids -other Stanhopeinae, Pescatorea and other Zygopetalinae, Brassia and many other Oncidiinae, many Dendrobium, Lycaste and Maxillaria species. All the materials above are available online.